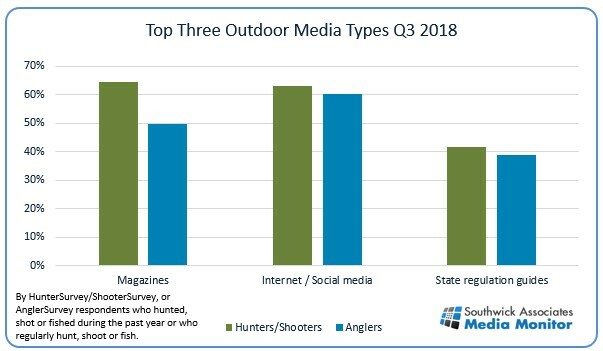 In the third quarter (July-September, 2018), according to Southwick Associates’ Media Monitor (SAMM), magazines edged-out internet and social media as the top source of information and media entertainment for hunters and shooters, while the internet held a significant lead over magazines and other media resources for anglers’ attention. American Rifleman was the top magazine among hunters, shooters, and anglers, and Jim Shockey’s Hunting Adventures was the top television show among hunters. Anglers are most likely to recommend Bill Dance Outdoors to interested new anglers, while YouTube is their preferred website. This quarter, new insights were added to the quarterly SAMM reports, including sportsmen and women’s favorite magazines and programs, the television programs they would recommend to friends, as well as who they follow on social media. This quarter’s “Digging Deeper” section examines hunters, anglers and target shooters top Twitter influencers plus providing insights regarding online shopping and more. For more information on contents and pricing, contact Nancy Bacon (Nancy@SouthwickAssociates.com) or click here.